Today is a busy Saturday, so I am not going to go on and on like I normally do, I’m going to cut through the chase and get right to it. What I have for you today is a fabulous, yummy, dessert like breakfast and a giveaway! Fun stuff on this Saturday morning!!! 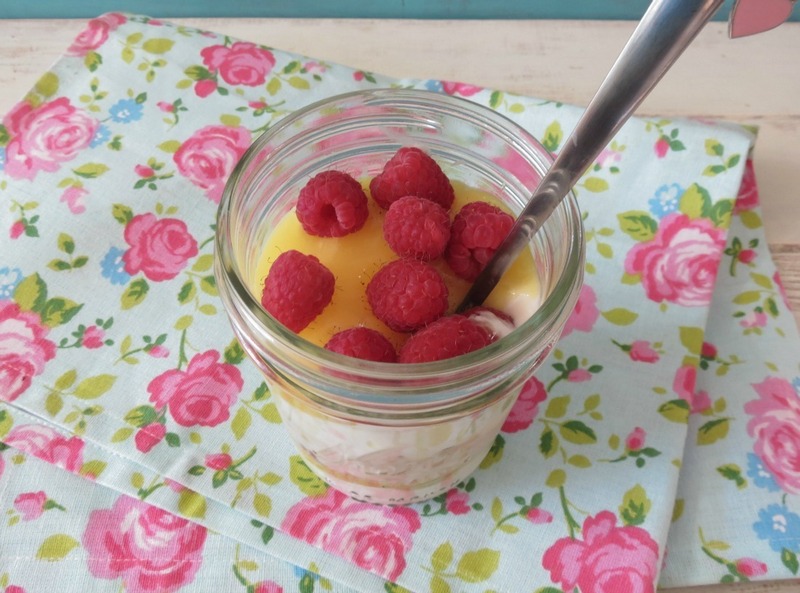 Today’s recipe is another one of my famous breakfast jars. I haven’t made a different breakfast jar since my first one of a year ago. I tend to stick to the same kind, but not today! 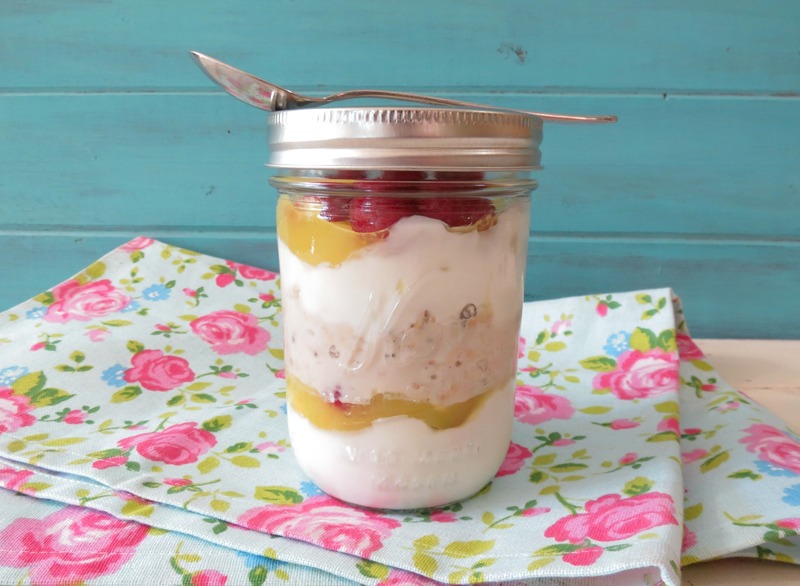 I do have to tell you I really, really love breakfast jars! They are filling, easy to make and of so good! Plus you can eat it right away or seal it up and take it with you!! I normally take it to work with me! I have also taken them to the Farmers Market and sit in the park and eat it, while I debate on what to buy and what I am going to make. Normally I know I am going to need more berries!! 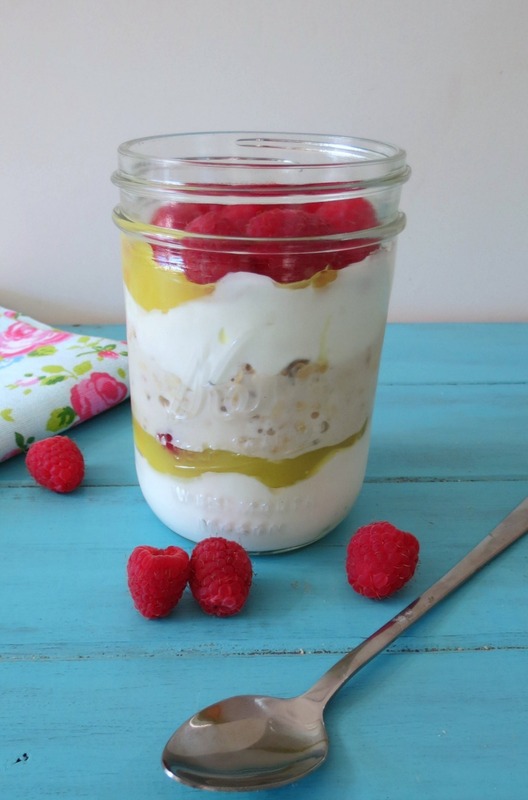 This breakfast jar is not my normal, of course it still has good for you overnight oats but it’s also flavored with lemon pie filling and fresh raspberries. It’s amazing! It’s like eating a meringue pie for breakfast!! The texture is creamy, rich and perfect for filling you up when you know you are going to have a late lunch. For the Lemon Pie filling I used Lucky Leaf Lemon Pie filling! This stuff is so thick and creamy and one spoonful and you think you are eating lemon custard. I am loving the pie filling. When my Husband saw the can of Lucky leaf Pie Filling he immediately requested that I make him a lemon meringue pie. Maybe, well see! Since raspberries are in season, I thought they would be a great match with lemon, but if you’re not a raspberry fan, blueberries and lemon is another amazing combination!!! If you never had overnight oats, you should really make them. The oats turn out thicker and creamy! Plus I like to add a pinch of chia seeds to thicken it up more and vanilla extract to give it some more flavor. Oh and I almost forgot I also added a pinch of stevia to it!! To make it, all you have to do is add all the ingredients and let it sit overnight in the fridge. Then in the morning you just layer your mason jar or bowl. Then eat and be prepared to let your taste buds go wild. 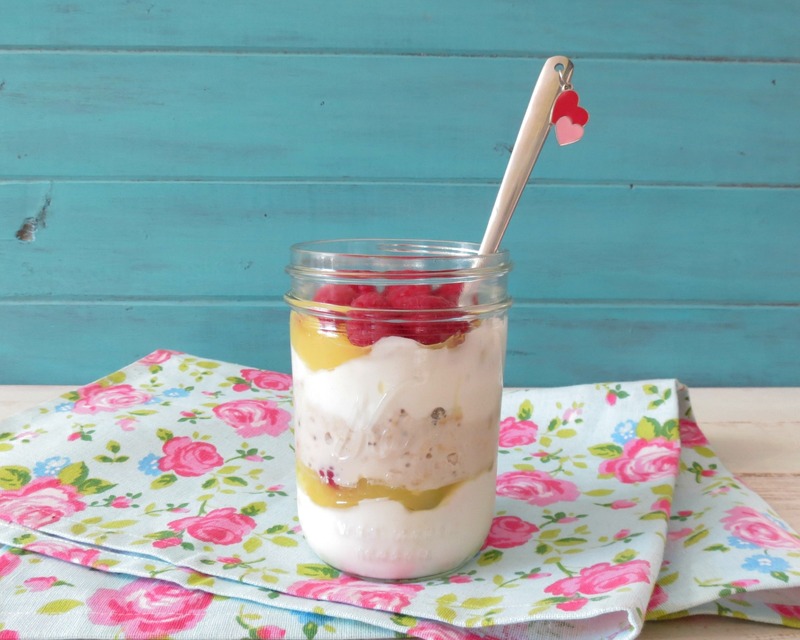 A healthy, sweet breakfast made with overnight oatmeal, yogurt, lemon pie filling and topped with raspberries served in a cute mason jar. The night before making in a small container, add oatmeal, milk, 2 tablespoons greek yogurt, chia seeds, vanilla extract and stevia. Mix well, cover and refrigerate for at least 8 hours or longer. The next day in a jar or bowl, layer, by adding ¼ cup greek yogurt, then 2 tablespoons of Lemon Pie Filling and top with a ¼ cup raspberries. Add your oatmeal. Top oatmeal with remaining yogurt, 1 tablespoon of lemon pie filling and top with remaining raspberries. Keep refrigerated until ready to eat!! Or take it on the go!! 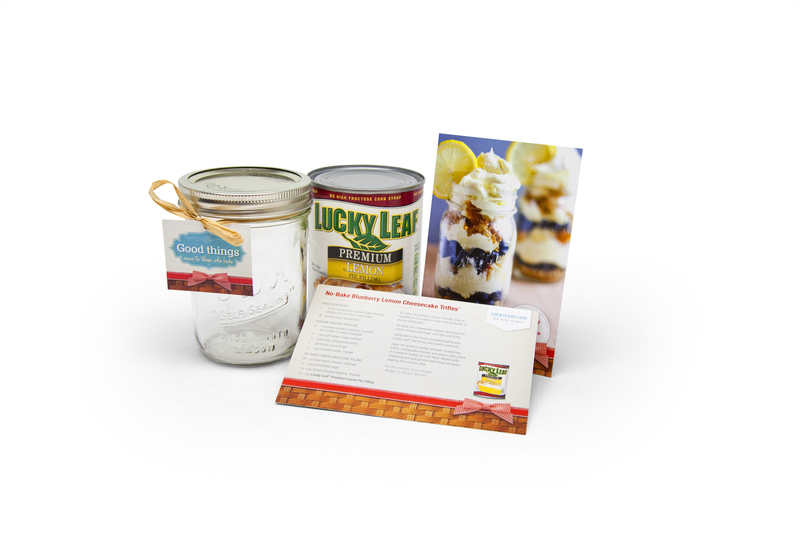 When I went on to Lucky Leafs website, I was astonished by how many flavors of pie filling they have! They even have sugar-free pie filling! Yah!! I bet your ready for the giveaway! 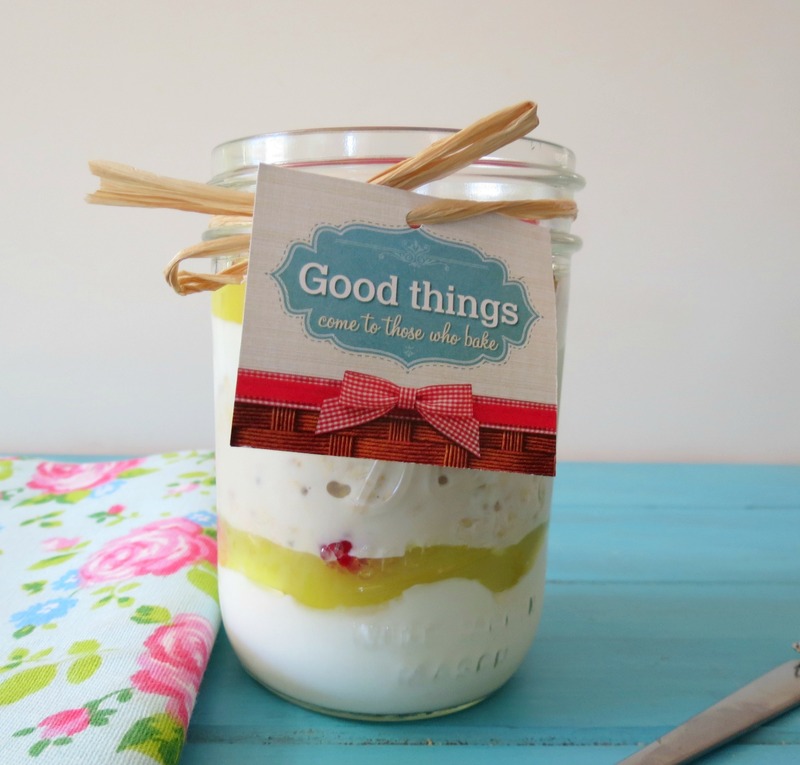 Well now you can make a breakfast jar just like mine! Lucky Leaf was kind enough to let me give to one of my readers a fun kit, just like I got. Fun Giveaway! To win all you have to do is tell me, what is your favorite kind of Pie? I’ll pick a winner on Tuesday night and announce the winner on Wednesday, June 26ths blog post! Well my Friends, today, I’m hoping to make it to the beach. I haven’t gone in over a year. Crossing my fingers it’s nice. It maybe hot at my house, but near the ocean it’s always cold. I’ll be sure to Instagram some photos if I go. 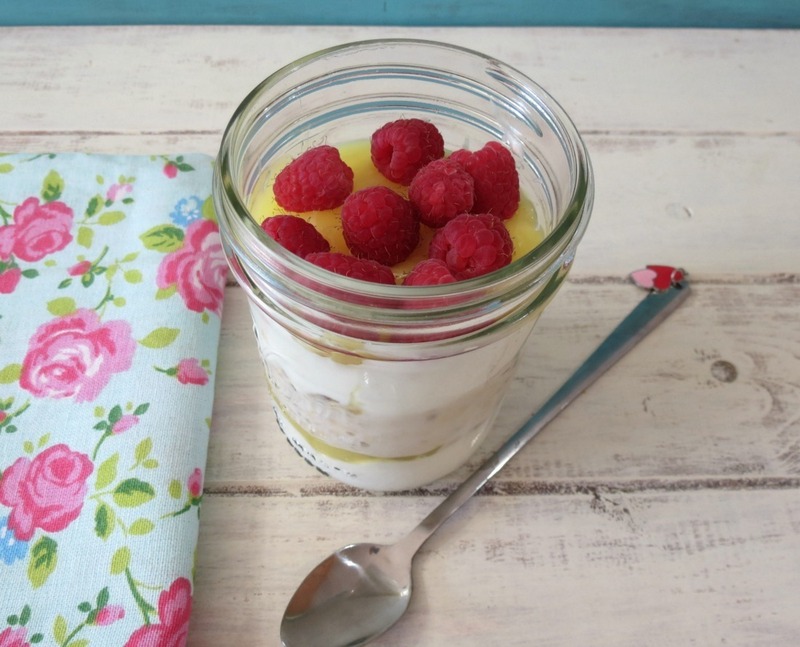 Plus I will be bringing my Breakfast Jar Parfait with me! Sorry I didn’t post this weeks weekly recap, I thought doing a giveaway would be more fun!!! Stay tuned tomorrow for another fun jar recipe. Breakfasts that taste like dessert are my favorite!! This sounds like a real treat. I love pumpkin pie with cool whip. Follow on Pinterest. Pinned Strawberry Coconut Shortcake. I love cherry pie! The crust and filling combination justs pops in your mouth for a sweet satisfying bite! I love strawberry rhubarb pie or lemon meringue. Both are my favorites. I follow you by email and love your recipes. I love Mixed Berry Pie! I get your lovely emails. I love coconut cream pie! My favorite pie (and dessert) of all time would have to be pumpkin pie. The sweet custard like pumpkin filling, on a warm crunchy crust, simply amazing. My favorite kind of pie is pineapple rhubarb. Not many people have even heard of it but my grandma has always made it and it is delicious! I am a new follower on pinterest. In fact this recipe is what brought me to your site. I pinned this and am sure I will find more to pin! Can’t wait to try this. I’m not a big fan of raspberries – the seeds bother me. I think I might try this with blueberries. Question: what type of oats do you use? Quick, regular, or steel cut? Thanks! Lakeshore triple berry pie (raspberry, apple, blueberry) ! Wow! This is a recipe I will be making! It sounds wonderful. I love many kinds of pie: lemon, peach, rhubarb, Dutch apple. But my all time favorite is gooseberry. I know it’s weird, but I’ve just always loved that flavor. I love banana or coconut cream pie, or a good apple pie – the crust is always the best part! My favorite pie is sour cherry – or pumpkin – or lemon meringue. heehee. I like pie. Ohhhh my gosh breakfast jars! What a GREAT idea! I recently started adding greek yogurt to my oatmeal, MAN that is goooood! Seriously amazing idea and these are too cute for words! I love greek yogurt to oatmeal! It makes it so creamy, but you know I”m a little obsessed with greek yogurt, I think I could add it to just about anything! Kentucky Derby Pie!! It’s my ULTIMATE favorite pie!! All pie is good, but Caramel Apple is one of my favorites. Love Strawberry Rhubarb Pie. Can hardly wait to make a Breakfast Jar thanks for sharing this. Blueberry pie is my favorite (blueberry anything, really). 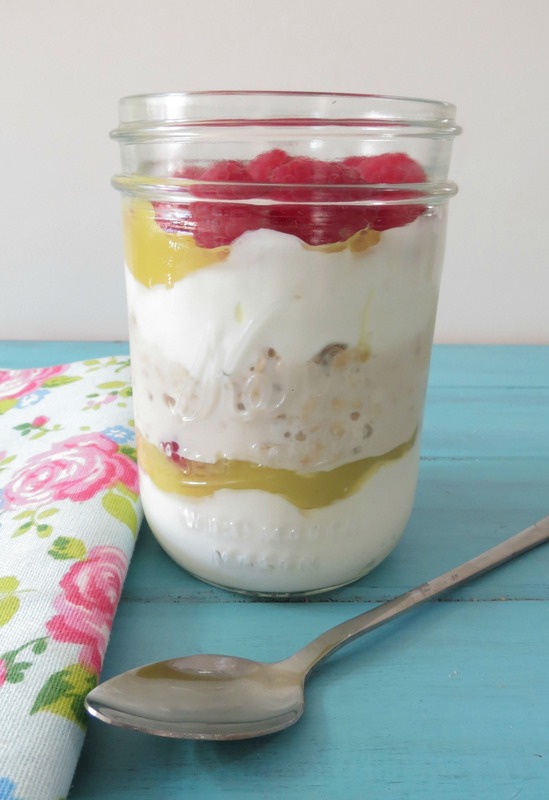 I followed you on Pinterest and repinned this breakfast jar! I love breakfast jars like this! So quick and easy to eat in the mornings. I think my favorite pie is apple! Lemon Meringue is my favorite pie. I’m a lemon meringue pie fan too! I love a blueberry pie! My Mom’s blueberry pie with fresh blueberries from the garden, reminds me of summer days growing up! Peach pie topped with vanilla ice cream! I love chocolate pie with meringue. I’m following you on Twitter now and will keep up with your blog. Your recipes are perfect for our family!